Oxford University Press, USA, 9780195181210, 679pp. In this gripping chronicle of America's struggle for independence, award-winning historian John Ferling transports readers to the grim realities of that war, capturing an eight-year conflict filled with heroism, suffering, cowardice, betrayal, and fierce dedication. As Ferling demonstrates, it was a war that America came much closer to losing than is now usually remembered. General George Washington put it best when he said that the American victory was "little short of a standing miracle." 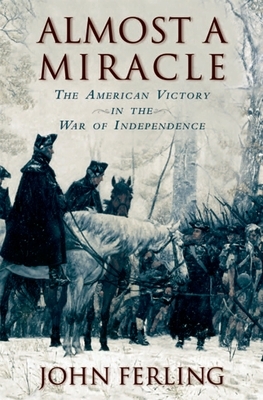 Almost a Miracle offers an illuminating portrait of America's triumph, offering vivid descriptions of all the major engagements, from the first shots fired on Lexington Green to the surrender of General Cornwallis at Yorktown, revealing how these battles often hinged on intangibles such as leadership under fire, heroism, good fortune, blunders, tenacity, and surprise. The author paints sharp-eyed portraits of the key figures in the war, including General Washington and other American officers and civilian leaders. Some do not always measure up to their iconic reputations, including Washington himself. Others, such as the quirky, acerbic Charles Lee, are seen in a much better light than usual. The book also examines the many faceless men who soldiered, often for years on end, braving untold dangers and enduring abounding miseries. The author explains why they served and sacrificed, and sees them as the forgotten heroes who won American independence. Ferling's narrative is also filled with compassion for the men who comprised the British army and who, like their American counterparts, struggled and died at an astonishing rate in this harsh war. Nor does Ferling ignore the naval war, describing dangerous patrols and grand and dazzling naval actions. Finally, Almost a Miracle takes readers inside the legislative chambers and plush offices of diplomats to reveal countless decisions that altered the course of this war. The story that unfolds is at times a tale of folly, at times one of appalling misinformation and confusion, and now and then one of insightful and dauntless statesmanship. John Ferling brings to this book nearly forty years of experience as a historian of early America. He is the author of nine books and numerous articles on the American Revolution and early American wars, and has appeared in four television documentaries devoted to the Revolution and the War of Independence. His book A Leap in the Dark won the Fraunces Tavern Book Award as the year's best book on the American Revolution. He and his wife live in metropolitan Atlanta.